June 1940. July 1940. Aug. 1940 The June mtg. was held with Mrs. Mitchell. Voted to send a card to Miss Clara Phillips because of the death of her mother who had been a member many years. May min. approved. Ada Park-Secy. July 1940 meeting was held at the home of Mrs. Ed. Lincoln Jr. Annual meeting and Potluck. June min. approved. Ada Park. sec. 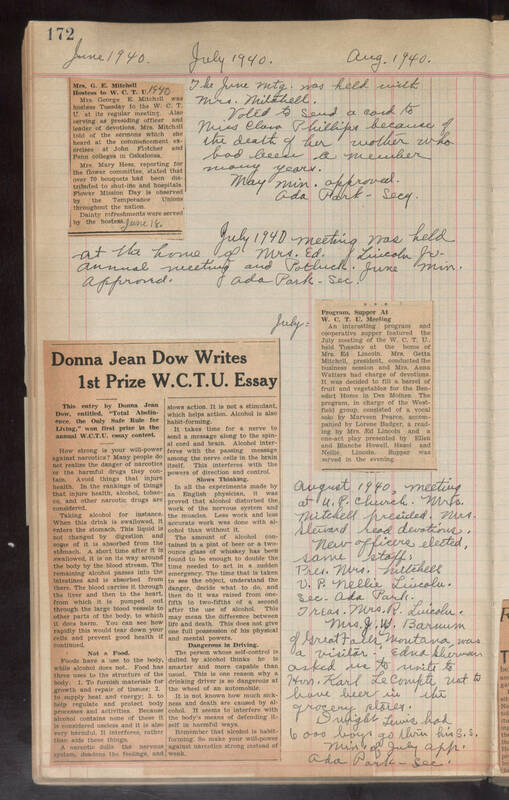 July= August 1940, meeting at U.P. church. Mrs. Mitchell presided. Mrs. Sleivard read devotions. New officers elected. same staff: Pres. Mrs. Mitchell V. P. Nellie Lincoln. Sec. Ada Park. Treas. Mrs. R. Lincoln. Mrs. J. W. Barnum of Great Falls, Montana was a visitor. Edna Bterman asked me to write to Hon. Karl LeCourfte not to have beer in the grocery store. Ourgbs Lewis had 6 ooo boys go thru his S.S. min. of July app. Ada Park - Sec.